The Tree of Life is a movie of infinite moments, culled from one person’s singular experience and placed side-by-side in a free-floating mosaic. The best of the film’s posters plays off this idea: still images from different scenes are gathered in a patchwork, though not ordered according to the movie’s nonlinear chronological progression. Whether conscious or not, this separates the poster’s purpose (to sell) from the film’s (to represent, or better, re-present). Interestingly, several of my colleagues have said that certain images in Terrence Malick’s semiautobiographical opus are little more than affected bric-a-brac pilloried from perfume commercials (a shot of a commedia dell’arte mask sinking through the ocean is a frequent target for criticism) or computer screen savers (in the case of the “creation of the cosmos” interlude, featuring work by special-effects legend Douglas Trumbull and others). We should be thankful that these negative judgments—perfectly defensible—are near-entirely balanced out by the rest of the commentary on the film. (For me, the cosmos sequence feels overwhelmingly tactile and purposeful, in no way a technological placeholder behaving randomly, and the submerged disguise, when considered in context, implies a beautiful conviction about our human comedy: At the end of time, the masks fall away.) This is the mark of a truly vital work, one that sways, flows, and moves with the tides of opinion. Rather than incline solely toward preferred sentiments (those equally superficial extremes of fawning love or vigorous hate), the film invites voices of all tenor to engage it and encourages dialogue that can never truly be silenced. We resonate, or—to quote Malick’s previous film The New World—we rise. Of all the images, sounds and mo(ve)ments to explore in The Tree of Life, I’m most fascinated by the section during the cosmos sequence that recreates the epoch of dinosaurs. This was, unsurprisingly, a prime talking point for fanboys (myself included) during the many months of pre-release buzz. (Malick and Pleistocene beasties? Woot!) And after I hung the movie’s mosaic one-sheet on my wall, I would often play a Where’s Waldo–like game with friends: “Can you find the dinosaur?” I’d ask, and since that part of the poster was around eye-level, everyone would spot the image—of what looks like a silhouetted raptor out of a Steven Spielberg super-production—almost immediately. The lead-up to any anticipated film is filled with such juvenilia. Hopefully, we’ve put those childish things away (those heart- and mind-clouding expectations) by the time the movie itself rolls around, so we can best judge the work of art as it is. That’s certainly not easy: I’ll admit I felt more than a twinge of disappointment when the first dino appeared—a wounded plesiosaur, lying in the surf, tending to a large gash along its side. It seemed so noticeably digital, something I figured was anathema to the Malick way of doing things, and at odds with the tenor of what had come before. (The teenage boy in me, too, wished for a little more teeth-baring in the Jurassic Park vein.) Fortunately, the twinge was gone by the next scene in which a smaller dinosaur (I’m not certain what species) stands alone in a forest and squawks loudly—for what purpose we’re never entirely sure. From Spielberg’s tinkerings to Malick’s intimations: What is that squawking, digital dinosaur thinking? Is it crying for mommy? Listening to the sound of its own voice? Such questions are about as answerable as “Do androids dream of electric sheep?” and no less troubling in their abstruse inconclusiveness. 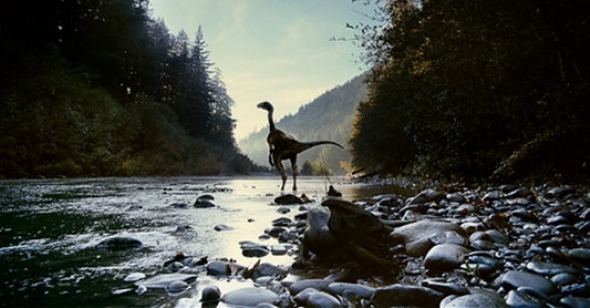 But all this is prelude to the subsequent scene, which I describe here in as dispassionate detail as possible: A similar breed of dinosaur to the one in the forest—perhaps the same one?—lies bleeding beside a riverbank. (The two preceding, half-dreamed images—wounded creature; solitary creature—have now merged; call it the third panel in this evolutionary triptych.) A raptor-like creature sidles up and stops to loom over the dino. It places its foot heavily on the smaller one’s neck. It pauses for a few inscrutable seconds. Then it lets go and moves on. by critic Robert Koehler—takes great issue with the dinosaur sequence, this third part in particular: “This is pure anthropomorphism,” Koehler writes, “and precisely the opposite of [Stanley] Kubrick’s apes-into-men [in 2001: A Space Odyssey]. Such a depiction of dinosaur love is little more than human wish fulfillment, a fantasy—even a romance—of altruism amongst animals, and this after having just been told in blunt terms on the film’s whispered soundtrack that ‘nature’ is bad.” His points are well-observed. So many movies condition us to think of animals as blessed with human wants and desires. And so many movies use digital technology to mimic the illusion of the everyday, in the process eliminating mystery and quintessence (what John Hurt’s character in Crystal Skull might refer to as “the space between spaces”). But I believe Malick goes beyond the mere creation of facsimiles (for creatures, it should be noted, for which we have no living, breathing reference point—only dug-up bones, post factum science and the limits of the imagination). To say the raptor is altruistic in sparing the smaller dinosaur’s life is only one part of the equation. If we see a flicker of humanity there, it’s our own projection, tantamount to something the O’Brien boys (the Texas siblings whom the film follows for the most part) might do during a playtime rumination. (Among its many faces, Malick’s film is an assured boys’ adventure.) Equally possible: the raptor is acting solely on instinct. It doesn’t kill its perceived prey for reasons commensurate with the flick of a genetic switch. To gaze at instinct is to stare into the void, and not just the one evoked by the film’s opening epigraph from the Book of Job. For The Tree of Life is as much concerned with the absence of spirit as its presence. If we looked into these dinosaurs’ eyes, what would we see? Probably darkness, pure animalism that would likely end with our being torn limb from limb. And yet, observed from a distance, focusing more on body movement and interaction with creatures other than ourselves, mightn’t we also see some stirrings of a soul? Something inexplicable that only becomes clarified—and still never completely—when given human form? (Debate amongst yourselves whether that’s an evolutionary leap forward or divine punishment.) To me, Malick isn’t engaging in anthropomorphism in these scenes so much as inviting us (maybe even expecting us) to read them that way, before counteracting and complicating them via The Tree of Life’s own accumulation of sensations and experiences—the evolution of narrative through reverie.